The software module «Explore» is a universal tool of analysis of geologic and production information. It has designed to solve problems of development state analysis and to study geological structure of hydrocarbon deposits. It allows taking information from all partitions of data bank BDM: Production, Geology, Hydrodynamic investigation, Well logging, Core salvage, Drilling, Workover actions, Blocks of development and others. The software module «Explore» is a powerful tool for solving the problem of developments monitoring, that is attributed to analysis and author’s interpretation of geological and production information. It has time-tested tools for a construction of the one-dimensional model of a production forecast. 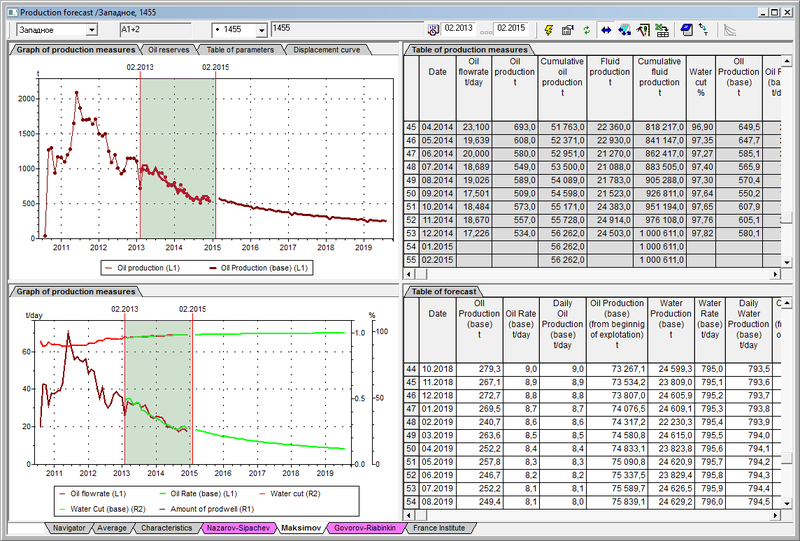 It also has tools for a calculation of workovers efficiency and an estimation of energy states of deposits. Functionality of the subsystem of development blocks monitoring consists of full range of actions: from a creation of blocks and a calculation of weighting factors till a reserve calculation and an analysis of development parameters. Analysis of daily measurements, adjusted at the end of the month. It is possible to visualize information in the form of standard documents: tables, maps, well logs and correlation charts with displaying information from different database partitions. A document «Map» is designed to view of well positions, locations of contours, faults and clay zones, structure maps and others. It is designed to show deep and overlapped structure by using isolines and abs. depth. The «Map» describes general idea of geological structure, tectonic features and other properties of some lot. It allows visualizing coordinates of intersection of well with formations, information layers of wells in the form of circular diagrams, labels and symbols. The document solves a problem of uploading of various elements stored in files or database. Data is obtained by the query to database «BDM Optima». The user can get complete information from the database for each object in the Document «Map» (well, contours, information layers, etc.). For operative workovers planning the software module «Explore» has tools to set new planning workovers on the map. It also has tools for the analysis of executed workovers by well and well selection for workover. The documents are designed for the visual analysis of executed workovers efficiency and qualitative assessment of the falling of production gain. The documents of the section «Workovers» provide user convenient and flexible tools for solving the problems of the calculation of production forecast. 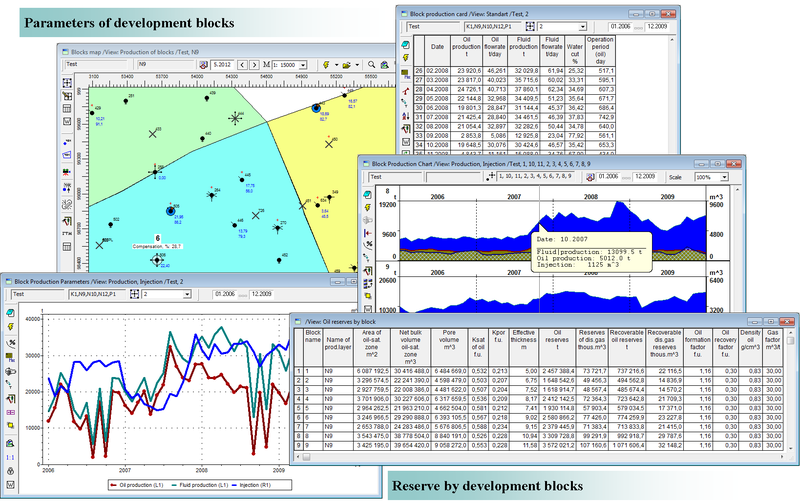 displaying boundaries of development blocks on the «Development status map+». To simplify the user work all the components of two-dimensional models (maps, contours) are stored in a hierarchical directory on the disk: in the local project or in the form of documents of the software «BASPRO Optima». In course of the works the local project is being built on the disk. It is a systematized collection of directories for storing files of the works results (isobar maps, systems of contours, boundaries of development blocks, project wells, etc.). An author’s project, that has been created in the software module «Explore» and has got the status (for example, approved by the company), can be integrated into a corporate database for the general use. It is possible to vary the basic data in the local database (DBMS Access) and save the satisfactory results of calculation in main database (DBMS Oracle). The software module «Explore» downloads the basic data by wells from a database of the local project (DBMS Access, data model «BDM Project») or from a corporate database (DBMS Oracle, data model «BDM Optima»). To construct an isobar map the user can use the following methods: Kriging, B-spline, Radial basis function. The main principle of the map generation is to calculate the values at the nodes of a regular grid from the values at the nodes of an irregular grid. The values at the nodes of an irregular grid (for example, wells and fictitious wells) and the values given along the contours (for example, contours of fluid contact, faults and clay zones) are the basic data needed for the construction of a pressure map. Estimation of workovers efficiency by the LUKOIL procedure is calculated from the water-oil displacement characteristics based on a monthly production report. The calculation is performed according to the LUKOIL methodological instructions. Production forecast by well (group of wells / development blocks / well pads) is performed taking into account the decommissioning by watercut. Analysis of daily measurements by wells. Analysis of daily measurements adjusted at the end of the month by wells. Calculation of deviations in daily production parameters in given time frame. Analysis of increment of daily production parameters. Calculation of deviations in daily production parameters from planning technological mode at the given date. Calculation of forecast daily production parameters and deviations in forecast parameters from planning technological mode. Time averaging of daily production parameters. Analysis of changes in well operation. Calculation of deviation in injection from target level. Estimation of workovers efficiency based on daily measurements. The software module «Explore» also has a system of communications and data exchange with MS Excel. The software module «Explore» is designed to work with text documents and graphic images. It supports the following file formats: *.sf, *.ctr, *.ch, *.rel, *.txt, *.doc, *.las, *.xls, *.lst, *.cml, *.mdb, *.log, *.shp, *.bln, *.cps, *.csv, *.gen, *.bmp, *.jpg, *.gif, *.emf, *.png, *.tiff. The functionality of the software module «Explore» allows the user to create the necessary output documents (maps, tables, graphs) in accordance with current industry standards.